In this day and age, refusing an invitation to a social gathering or an event is what we all dread as there is always a fear of coming out as a rude person. जब आपके कोई दोस्त या रिश्तेदार किसी party या social gathering का आयोजन करते हैं, तब वे उम्मीद करते हैं कि आप उनके करीबी होने के नाते उनका invitation स्वीकार करें और उनकी party में शामिल हों। It’s quite obvious that you would want to go there too. When someone invites you to a party, it’s simply rude not to reply because then the host would never know the number of guests who will be attending the party and would not be able to make proper arrangements. All because of your hesitation to say NO. Nowadays, we all lead a busy life and at times, it’s not possible to mark your presence at every social event. But then, it’s always considered rude to decline someone’s invitation. WHAT TO DO NOW? I’ll tell you what, LEARN TO TURN THEM DOWN GRACEFULLY. • I really appreciate the offer, but I’m swamped with work this whole week. I hope you understand. • Your get-together sounds like so much fun, but my husband and I already made plans to go out on a date. I’ll be there next time. • What a bummer! I have another commitment. Hope the party is a success. • I would love to catch up with you tomorrow, but I’m committed to something else at that time. Can we schedule a hangout for another date soon? • कल आपसे मिलकर मझे बहुत ख़ुशी होती, लेकिन मैं उस समय कुछ और करने के लिए प्रतिबद्ध हूँ। क्या हम मिलने के लिए जल्द ही एक और तारीख रख सकते हैं? • Unfortunately, I won’t be able to attend your destination wedding in London. I would love to take you to dinner before you go. Can we set something up? • Congratulations on your 25th wedding anniversary! I wish I could attend your party, but I’ll be out of town for this weekend. My heartfelt wishes are always with you two. • Thank you for inviting me, I appreciate your humble gesture. I would love to share this day with you, but to my bad luck, I will not be able to come due to some health issues. Please accept my apologies. कुछ लोग ऐसा भी सोचते हैं कि पहले से मना करने कि क्या जरूरत है? इससे बेहतर है कि कुछ कहे बिना ही पार्टी में न जाया जाए। But that’s completely wrong and you should never ever think of doing that. यदि आप एक से ज़्यादा वजह बताएंगे तो सामने वाले को लग सकता है कि आप झूठ बोल रहे हैं या बहाना कर रहे हैं। Keep it simple and real. No need to make awful excuses because it’s perfectly acceptable to decline an invitation! 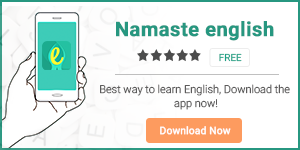 इसी तरह अपनी English communication skills को और भी बेहतर बनाने के लिए download करें हमारी English learning app Namaste English.